Vibrant blue and yellow with flashes of purple, this beautiful parrot figurine stands 5¼ inches tall. It has no flaws. It's marked KW142B and has a color crown logo and sticker. Pinkie and Blue Boy Musical Figurine! A beautiful figurine inspired by the famous "Pinkie" and "The Blue Boy" characters. The music box plays "True Love". The flawless figure stands 6¾ inches tall and has a Lefton sticker. Beautiful figurine in ivory-white porcelain with gold trim; inspired by the famous etching "Praying Hands" by 15th Century master Albrecht Dürer. 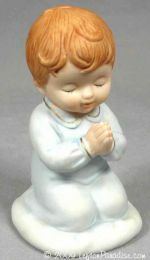 The music box plays "The Lord's Prayer". Standing 6½ inches tall, the figure is in flawless condition. It is dated 1997, marked 11116 and has a Lefton sticker. #6 of the Precious Moments Birthday Circus Train, the Giraffe car. "Keep Looking Up". The figure stands 5¾ inches tall and is marked 15997. It also is stamped on bottom. In flawless condition. A charming wooden figurine depicting a prince admiring his princess in a tower. It has its original Lefton gold seal hang tag. In otherwise flawless condition it is missing some of the dried flower decoration at the base of the tower. The music box plays "A Time For Us" theme from the 1968 motion picture "Romeo and Juliet".